Sakura Japanese Restaurant | Restaurants of the World Unite! Yay Japanese food. As cheeseless cuisines go, Japanese is the tops. There’s a wide variety of choice and it can be healthy or indulgent. The problem is that decent Japanese food is hard to find in the UK and when you do find it, it’s harrowingly expensive. Gyoza. Gyoza is the real test. If the menu lists chicken or vegetable gyoza then hightail it out of there. 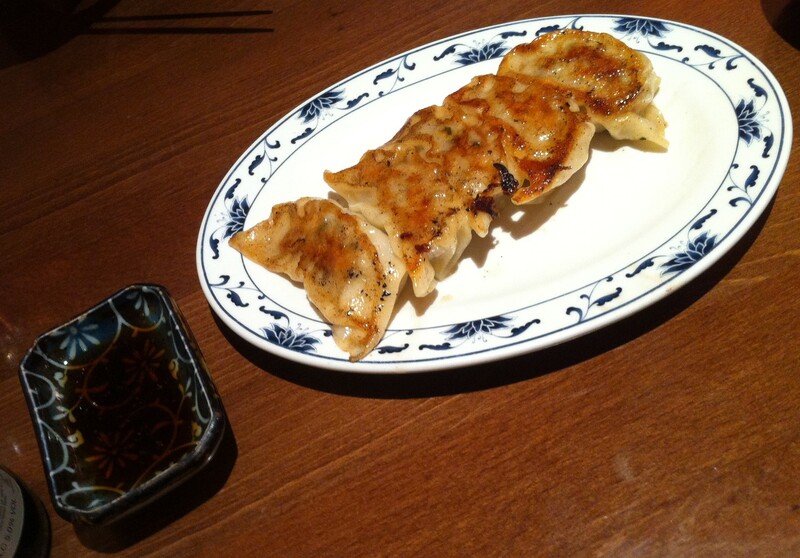 It might be quite authentic, but gyoza are made of pig meat and that’s that. 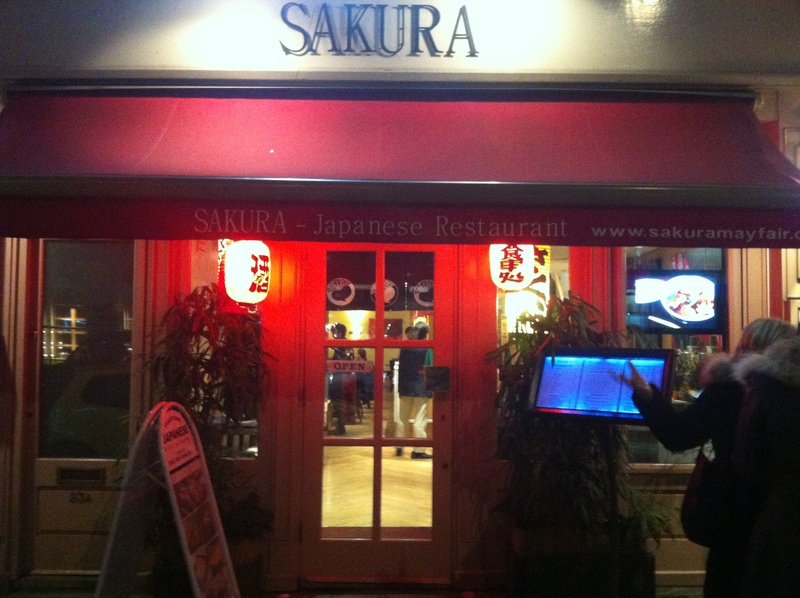 Which is where Sakura restaurant (http://www.sakuramayfair.com/) got it right last night. Me and Lady McMonte ducked in there to avoid the inevitable argument at Pizza Express. Busy, with bona fide Japanese-talking Japanese running the place my hopes were high and rewarded. The gyoza were cooked properly (though we weren’t trusted to mix our own dipping sauce (soy sauce, rice wine vinegar and chili oil). The yakisoba was chinese style and the noodles were (purposefully) crunchy – I think I misordered – but it was tasty nonetheless. With a fanfare of sashimi and edamame, the main event was the tempura. The batter was light and crispy and we were allowed to mix the grated daikon and ginger into the dipping sauce ourselves – another authentic touch. 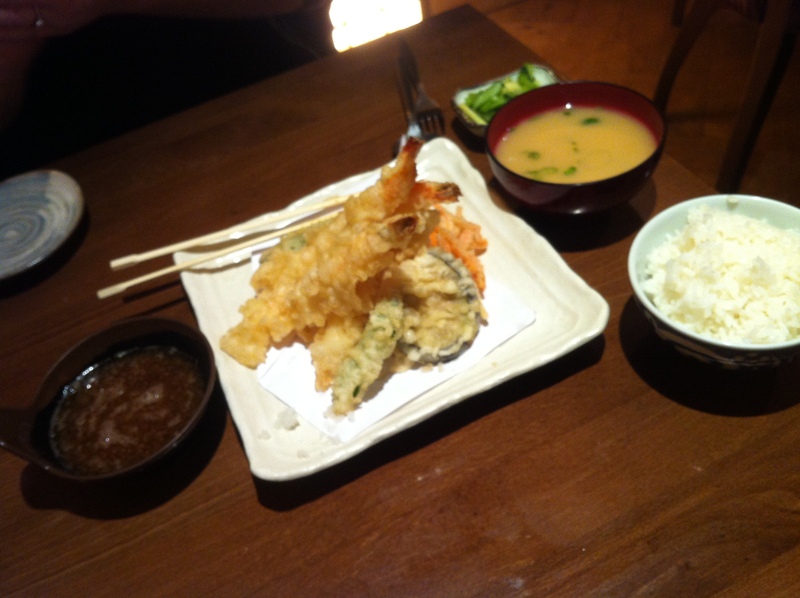 Ginormous prawns, pimen and other vegetables, this is as good as tempura gets in the UK. Washed down with a tall, cool Kirin, I could have been in my local Tsubohachi gearing up for some karaoke. The restaurant itself is nice enough and clearly a popular destination for Japanese and I’d definitely go back – £50 for two people with booze. 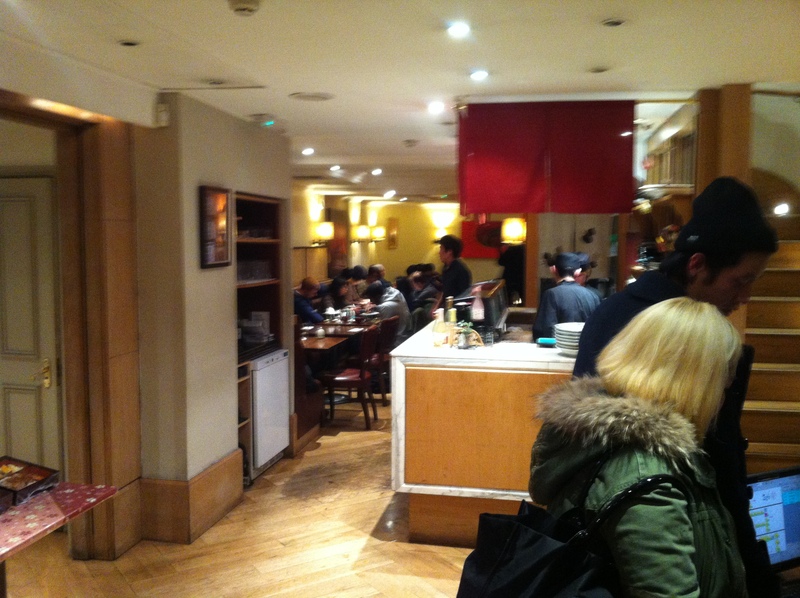 There are a gazillion other Japanese restaurants in London all with their pluses and minuses: Ten Ten Tei (in Soho) and Tokyo Diner (http://www.tokyodiner.com/) are pretty authentic and not too pricey. Taro Restaurant (http://www.tarorestaurants.co.uk/) is cheaper, but I feel like some of the dishes have been modified for a western palette. Dozo (http://www.dozosushi.co.uk/) is great but expensive. I’ve heard good things about Akari (http://www.akarilondon.co.uk/) and Roka (http://www.rokarestaurant.com/) but not visited them yet. Actually, the sushi from Wasabi (http://www.wasabi.uk.com/) is perfectly OK and the onigiri are a welcome treat, the hot dishes not so much. Now with positive feelings, heart, good time and life! Ok, it looks a little like a dentist’s waiting room, but that’s not the ambiance, believe me. The noodles started off crunchy then became floppy. Scientists are baffled. The red lanterns denote “good times.” I should wear one. Awesome. Interesting that you can get such a wide variety of Japanese food in one restaurant. Its kind of like having BBQ steak with spaghetti on the same menu. But I remember the same thing in Oregon. 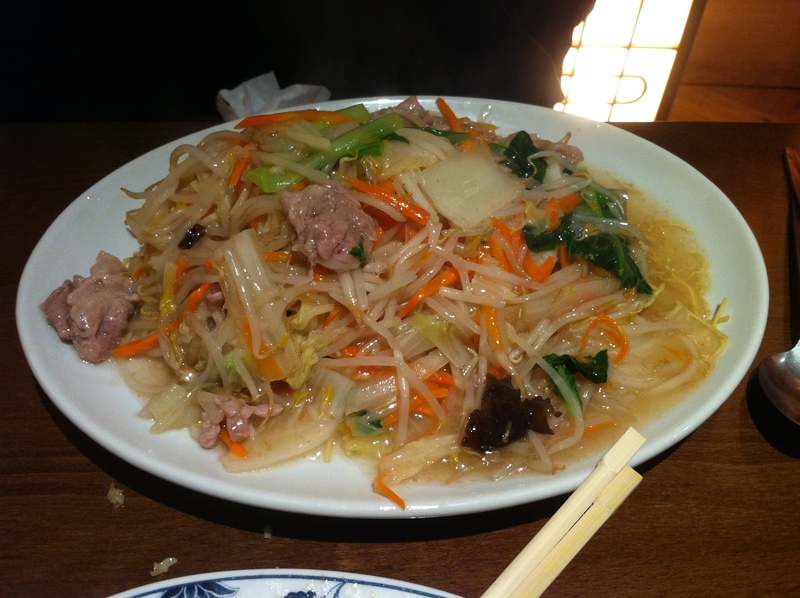 The restaurants have a really varied menu to help patrons find that one dish that symbolizes Japanese food for them. I think that’s the norm outside of Japan, there just isn’t the market to sustain specialty restaurants like the ones which are ten-a-penny in Nippon. I’ll definitely be trying this out! 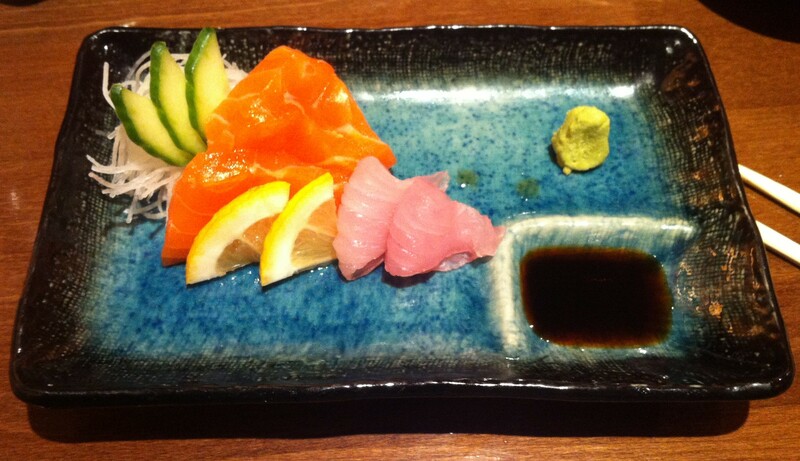 I love Japanese food, but I’ve mainly only sampled some delicious sushi from a place called Mori – in Kensington I think? And a Bento in Camden. I don’t know much about the traditional food so I would never have known gyoza was meant to be pork…they look very similar to a certain kind of dumpling I got from a take out though. Szechuan or something? Either way, lovely :) Can’t wait to taste some tempura! Those dumplings aren’t exclusive to Japan – there are loads from China which are similar, but Gyoza are meant to be pork (mixed with cabbage I think). And then cooked in a specific way (fried then boiled). For me it’s just a give away when they don’t do pork. Will certainly check out Mori! The new ramen restaurant Shoryu is causing quite a buzz – you might want to give it a go. Thanks for the heads up SCB – proper ramen is hard to find. It also reminded me that I forgot to mention Abeno (http://www.abeno.co.uk/) an okonomiyaki place near Leicester Sq – almost as good as the real thing. Grrrrrrrrrr! You mention wasabi and not the bento cafe in Camden. Shame on you BIL!